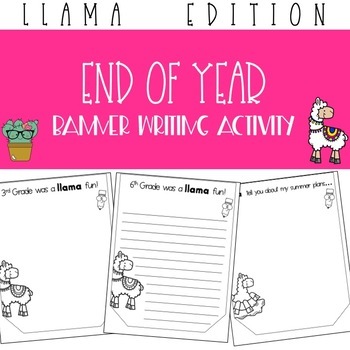 This product includes everything you need to have a fun end of year writing activity! 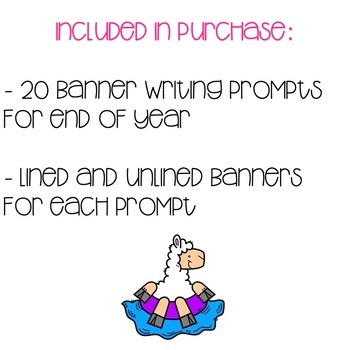 Included is a set of 20 different writing prompts (the last is blank to create your own prompt) on banners. Each writing prompt comes on a blank banner or lined banner and fills up an 8.5x11 sheet of paper. 1. Kindergarten was a llama fun! 2. 1st grade was a llama fun! 3. 2nd grade was a llama fun! 4. 3rd grade was a llama fun! 5. 4th grade is a llama fun! 6. 5th grade is a llama fun! 7. 6th grade is a llama fun! 8. 7th grade is a llama fun! 9. 8th grade is a llama fun! 10. 9th grade is a llama fun! 11. 10th grade is a llama fun! 12. 11th grade is a llama fun! 13. 12th grade is a llama fun! 15. Last day of school? No prob-llama! 16. Llama just say this year was great! 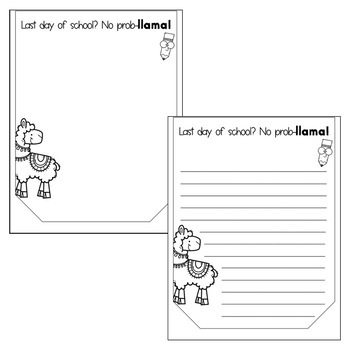 Allow students to color in the llama and pencil clipart when finished. Makes a fun end of year bulletin board activity or a keepsake to remember the school year!